Dual Food or Soup Stainless Steel Warmer. Great for concession stands or convenience stores! This 18/8 gauge stainless steel countertop food warmer is perfect for a wide variety of foods. Simply plug in and start serving! Insulated to protect interior parts and countertops from heat build up. Interior liner formed of strong stainless steel. There is a drain spout on the front to make draining the water easy and safe. Outside Dimensions: 21" long, 13" wide, 10 high. Inside Dimensions: 20" long, 12" wide, 6 high. Power: 1200 watts, 120 volt, 10 amps. 2 stainless steel inserts (8 quart capacity each side). For other Kitchen and Restaurant Supplies, Draft Beer Equipment and much more! We're Here To Help. If you are outside of the USA, select your country to see international rates (Canada will need to enter postal code). Check out our Smart FAQ! It's sometimes very expensive, but unfortunately beyond our control, we use the most affordable rates available. _gsrx_vers_333 GS 5.4.2 (333). 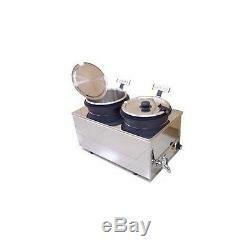 The item "Dual Food or Soup Stainless Steel Warmer Heater" is in sale since Thursday, April 25, 2013. This item is in the category "Business & Industrial\Restaurant & Catering\Commercial Kitchen Equipment\Cooking & Warming Equipment\Soup & Steam Kettles".